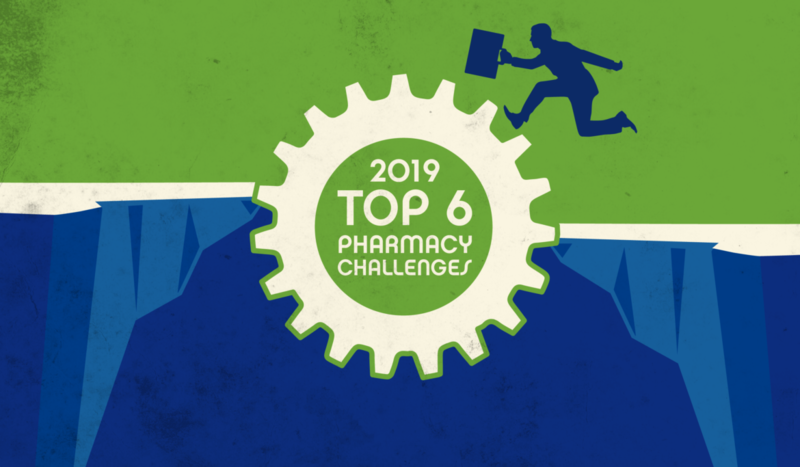 The Top 6 Challenges Facing Community Pharmacy in 2019 – Are You Ready? It’s hard to believe we’re heading into the fourth quarter of calendar year 2018. What’s even harder to fathom is that 2019 is closing in fast. And, with the new year will come a whole host of new challenges your community pharmacy should prepare for. You’re probably thinking: Wait! More challenges in 2019? What are they? Where do I start? Don’t worry. We’ve got you covered. We’ve been watching the coming trends for 2019 and are here to share the top 6 (and ways to beat them). There are approximately 67,000 retail pharmacy locations around the country, which means these pharmacies are continuously vying for more patients. According to Drug Channels Institute’s 2018 Economic Report on U.S. Pharmacies and Pharmacy Benefit Managers, retail pharmacies dispense an estimated 47.4 percent of prescriptions. Yet, their prescription revenue share is in decline (from 35.9 percent in 2012 to 32.6 percent in 2017). This is due in part to increased reimbursement challenges and other industry factors. To patch the leak, retail pharmacies are often turning to consolidation and acquisitions to increase patient markets without having to start from scratch. Meanwhile, community pharmacy’s market share has dropped slightly, however, revenue continues to grow. Specialty pharmacy fills represent around 24 percent of total revenue for community pharmacies, reported Drug Channels Institute. And, with specialty pharmacy fill volume growing each year, it’s reasonable for an independent pharmacy to consider adding this strategy to its services. However, breaking into specialty pharmacy is not without risk, and with the growing amount of specialty therapy competition, it’s critical for community pharmacies to do their homework before taking this step. Community pharmacies must do a thorough market and opportunity assessment to ensure this move is indeed viable for their unique situations. How well does a pharmacy know it’s target market? Is that market right and ready for specialty pharmacy services? And, because specialty pharmacy is built on a completely different business model than traditional pharmacy (and requires a whole host of new technologies, policies, processes, and accreditations), is the pharmacy ready to take on the challenge? A complete analysis is the best way to approach this challenge. It’s also beneficial for pharmacies to recruit expert help from specialty pharmacy development veterans early in the assessment process. There’s no question that technology can and does help pharmacies perform with more precision, accuracy, and fewer errors. According to URAC, through its 2018 report on retail community pharmacies, today’s technologies enable pharmacies to enhance quality assurance, reduce dispensing errors, boost patient adherence directly and passively, flag potentially dangerous drug interactions, and even synchronize patient medications to run their businesses more smoothly plus spend more one-on-one time with their patients. But with so many new technology options in the market, how can a pharmacy choose the right ones? The key to making the wisest technology decisions resides with the pharmacy’s objectives. This list merely scratches the surface of the technologies that are available to help pharmacies run more safely and smoothly. To ease the burden of making the right choices, it’s important to investigate technology options based on the pharmacy’s greatest needs and opportunities. Provider status is a legislative slippery slope for pharmacists and one that often impacts being paid for services provided. This continues to rate high as a 2019 challenge. At present, 34 U.S. states recognize pharmacists as “providers or practitioners,” reported the Drug Channels Institute report. However, this is done only at the state statute level, and in some instances, through “state Medicaid provider manuals.” Under federal law, said Drug Channels, pharmacists are not considered providers and are not paid for associated services. In the past, community pharmacy lobbyists have worked aggressively (and largely unsuccessfully) to drive federal legislation to push provider level compensation for pharmacists. But recently, there has been promising movement. In January of 2018, according to URAC, the pharmacy industry witnessed the introduction of The Pharmacy and Medically Underserved Areas Enhancement Act (H.R. 592/S. 109), as well as an identical, bipartisan bill, to both the House and the Senate. The bill designates pharmacists as healthcare providers under the Social Security Act. This is an important issue that independent pharmacists should continue to watch and support. Collaboration with other community healthcare providers is a strategy we’ve championed for years to help independent pharmacies develop their patient markets. Taking it a step further, collaborative practice agreements (CPAs) are an extension of that strategy. With CPAs, a community pharmacy and other provider formally specifies which patient care services a pharmacist can provide beyond the typical practice scope. According to URAC, achieving a CPA takes more of a marathon mindset, versus a sprint. Communication, trust, and credibility on the pharmacist’s side is vital to building and nurturing physician relationships that break through liability and control concerns, and ultimately result in CPAs. Industry experts suggest open and honest conversations between pharmacists and physicians about MACRA challenges and how a collaborative relationship could help improve associated patient and financial outcomes. Community pharmacies see about 90 percent of total revenue from prescriptions each year, but margins are getting tighter. And, each time a patient leaves the store after only purchasing their prescription, lost potential revenue walks out with them. According to Chain Drug Review, only three percent of shoppers filling a prescription make other purchases at the same time. This marks a significant revenue opportunity for community pharmacies to tackle (and one that we continue to bring up). Pharmacies must consider a “shop the whole store” strategy to meet this challenge, head-to-head. This strategy starts with getting into the minds of consumers. Understanding challenges ahead of the game will help give your pharmacy the edge over your competition. With a little planning and research, you’ll be ready to make a successful run into 2019. What strategies has your pharmacy used to beat 2018’s challenges? And, are you ready for 2019? Have you found an approach or strategy more helpful than another? Which effort had the most impact? How has your pharmacy benefited –– or not –– from initiatives you’ve implemented? We’d love to know and may even share those experiences in future blog posts, white papers, and e-books. To share your story, please contact Jessica Gardner. And, of course, be sure to subscribe to our blog for more tips, insights and bulletins that can help grow your pharmacy and save you money – all from your partners at AlliantRx.